I know that Klipfolio is a great place to work. But that’s because I’ve been here a long time – long enough to feel like I belong. The work culture here is second nature to me now. 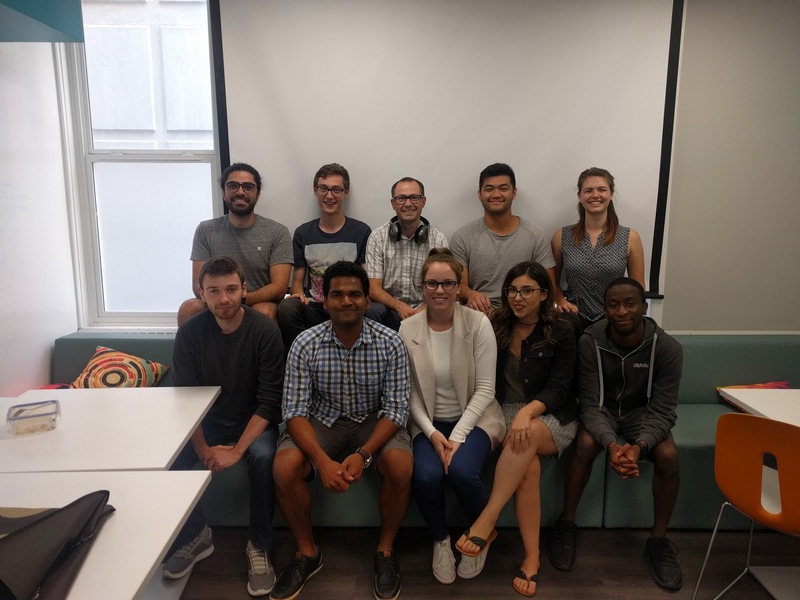 Today I want to let interns speak, in their own words, about their experience at Klipfolio. What follows was written by them. It is entirely their initiative and self-driven, which is amazing! Klipfolio’s work environment focuses on learning. Our work colleagues were all fun people. Having lunches and after-work activities (from board game night to pub night) with them and hearing all about the different activities they were up to only solidified the sentiment. Everyone – and we mean everyone – was friendly and happy to tell us about their job. The result is an upbeat environment without added stress – clearly the product of a company built by people who love what they do every day. We quickly discovered - and learned to appreciate - the company’s quirks which, when combined with great company and team events, always made us feel like we were part of the team. We liked that we were treated like full-time employees even if we were interns. We liked that everyone acts like an owner of their own contributions to the code base and expected the interns to adopt the same attitude. We liked that we always felt our opinions were valued. We liked that we got lots of recognition and thank-yous, both verbally from members of various teams and officially in the form of awards. Klipfolio customized thank-you award card! We liked the all-hands meetings and that everyone, across all departments, expressed pleasure with our work. It was great to see diversity and multiculturalism at work. We could often discover new foods since employees would bring their ethnic food to share, and all the different national celebrations were mentioned on our Slack messages. This reinforced the sense of community that is so strongly developed in the company. As Klipfolio interns, we liked the fact that we were thrown into real-life problems right away. We were pushing code into production on our first or second day! We were trusted with real tasks, just like any full-time employee. In that sense, we felt that we were having a tangible impact. Being trusted to tackle major issues during our first month was very empowering. We also had lots of opportunity to become champions. We could own our features and spearhead our own ideas. We had lots of autonomy and choice in our work. As interns, we enjoyed the fact that everyone is invested in learning what everyone else is doing at the company. We always found that others were willing to give us crash courses on things we weren’t familiar with. This meant that during our hack days, many of us were able to build tools to help other teams. In that context, a few things stood out: There was lots of interaction and information-sharing, there were ‘lightning’ talks about issues or problems, and frequent demonstrations. We got great continuous feedback, and enjoyed the fact that everyone is encouraged to provide constructive criticism. A typical meeting at Klipfolio. 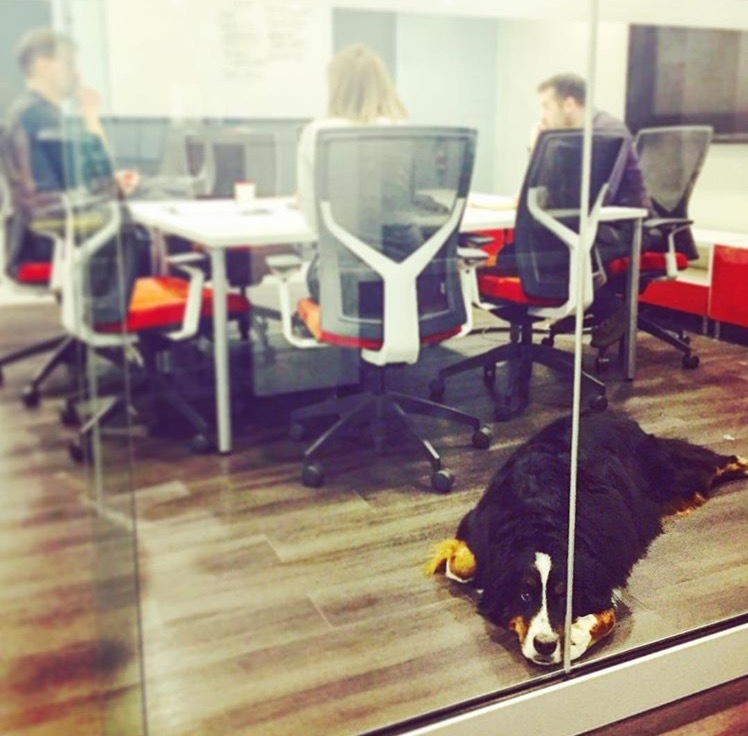 Dogs are easy to spot around the office. I attended a hackathon called deCODE where students were given the opportunity to work with companies, and I worked on the Klipfolio team. Hackathons are a great way for companies to test out potential interns before taking them on, but they are also a great way for potential interns to witness the Dev team’s dynamics before applying. After two days, we had a working prototype, and I had an internship! We’re surrounded by really experienced and knowledgeable devs who are happy to take the time to teach. It’s very much a learning environment where you’re encouraged to approach any dev on the team to ask questions in their respective area of expertise. If you want to expand your knowledge in an area that’s not necessarily relevant to what you’re working on, you’re encouraged to join one of the many guilds available. You also have the opportunity to share your knowledge with others at weekly Lightning Talks. The best thing about working at Klipfolio is the sense of purpose and belonging. There is constant communication between all teams, which allows you to understand the needs and ambitions of the company. Not only that, you are recognized for your contributions and are often thanked for your efforts. As a result, you are motivated to do your best because you feel your contributions do make an impact by not only helping the user, but also the team. How do you feel about your work? I worked on the Klip Editor team and I loved it. It is challenging and satisfying. The company provides you with a lot of trust and guidance. Therefore, I have had the opportunity to build new features and become an expert in certain fields within the code. Furthermore, I worked with an experienced and knowledgeable team, which advanced my skills and taught me how to approach problems and correctly design solutions. Don’t be afraid to ask questions. Everyone on the team is incredibly knowledgeable, and always keen to help. I was constantly floored by how much the Dev team embraced solving problems together. Developers who weren’t even on my team would often help me work through what was blocking me, even if it meant taking an hour of out of their day to do so. No developer is an island at Klipfolio; the whole team embraces that mantra, and I encourage you to do the same. What’s the most important thing you learned during your internship? Definitely the power of encouragement. How does Klipfolio set you up for success? Klipfolio provides a workplace culture that allows you to do what you do best. For example, I feel that I am treated like full-time employee instead of just an intern. I work on the same tasks that a full-time person would, allowing me to make a big impact and feel valued. Everyone here is incredibly friendly and willing to help if you get blocked. I even help the full-times occasionally. There’s also a ton of opportunities to champion a project, whether it is adding functionality to an existing project or creating a whole new one. This was the first time I enjoyed working extra hours. I like a kind of job that requires creativity as much as technical skills. The hackdays, scratch-your-itch day and the kind of tasks I was working on during my internship allowed me to expand my knowledge and creativity in different areas. What’s one thing you’ll take with you after you’re done? It is important to have a good technical knowledge related to your job, but it plays only a small role in your success in the workplace. There are many other factors like teamwork, seeing the big picture and so on. What are some key distinguishing points about the Klipfolio culture? I definitely enjoyed the team social events that reinforced the great culture at Klipfolio. We went on team-building events, organized trips to local festivals, and even to local pubs to catch up. One of the big summer Dev team events involved us going to an obstacle course park. It was a great time to bond and learn about the different aspects of what all of our Dev members do! Another point I really liked about Klipfolio was the scratch-your-itch days and hack days, where we can work on and present ideas that are not part of the standard work log for our product. This allowed me to experiment and develop sections of the platform that I was not familiar with and learn more about Klipfolio. I feel as if I am contributing to the success of business owners and customers every day. I work in the WebUI team and we tackle challenges related to the journey users experience with our product. It is a great experience to work with fellow developers, the User Experience team, project managers and the Support team to deliver quality improvements with every task. The knowledge of what I should expect in a workplace. 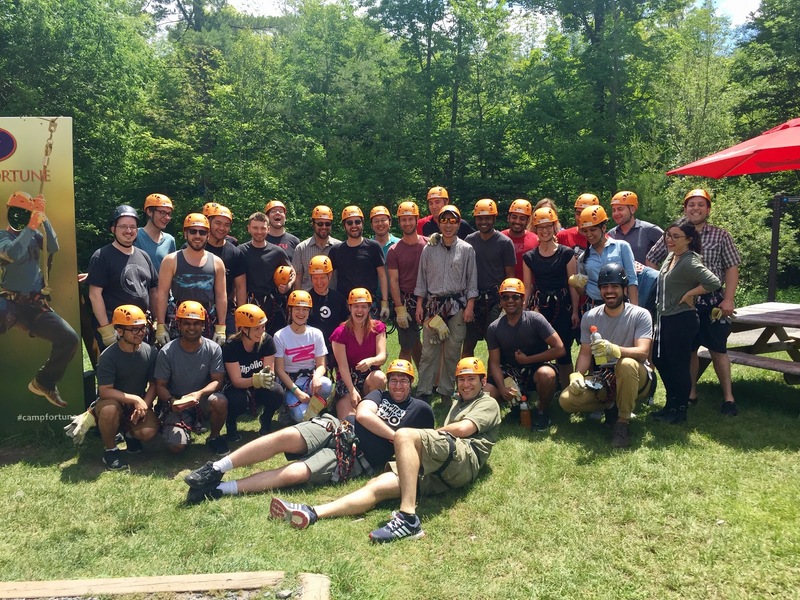 Klipfolio goes above and beyond to support their employees and the team environment. That sense of community and belonging has now become a mandatory aspect of any job I might look into in the future. It pushes you to improve, and supports you when you’re unsure – whether it be in software development or personal life. At Klipfolio, everyone is encouraged to learn as much as they can. It creates a lot of well-rounded, knowledgeable developers. I worked at Klipfolio last summer working with our API. I knew that for my next co-op I wanted to explore a different area of software development, specifically front-end. I asked if it was possible to work in a completely different area of the app if I came back, knowing I would contribute less than if I stayed in API. I knew I would learn more by becoming familiar with unknown sections of the app. They agreed and encouraged my request. Klipfolio creates a unique atmosphere which sparks creativity and challenges your intellect. Its open work environment is filled with smart people who are eager to share their knowledge, making Klipfolio an absolute pleasure to work at. Whether it’s completing a large feature or fixing a small bug, you know what your change is about. Klipfolio makes sure that you have a good view of the end goal, and how your changes are building blocks towards that goal. Seeing how your hard efforts help evolve a product gives you a true sense of accomplishment. I attended a talk that Peter Matthews, CXO at Klipfolio, gave at my school on how Klipfolio thinks out UX design and its product. He spoke about the product in a way that captivated me, and I knew I wanted to contribute to this product by working there. After the talk, I came up to him and expressed how amazing I thought the product was. By a stroke of luck, my program’s students association was hosting a talk at Klipfolio and I went along. That opened up the door for an interview. Klipfolio is one of the few companies that really takes investing in its potential student hires to the next level. Prior to beginning my term at Klipfolio, Ali Pourshahid (Director of Development) took the time to mentor me and to recommend resources. He worked with me on places where I could develop myself in order to be the most effective. That was indispensable. I think by a long shot, the most important thing I’ve learned is that high-growth companies like Klipfolio (the ones you definitely want to work at!) hire for the capacity to learn more than anything. That’s because the ability to learn almost always correlates with a hire’s ability to take ownership for a product. And trust me, you want to take ownership! Ultimately you want to be an owner and not just a hire. Klipfolio excels at that. Thoughts from our dev team on agile development, productivity, and tooling. +100 services and pre-built metrics to choose from. Start building dashboards for your team and your clients.